The iciest blasts may still come on Thursday. 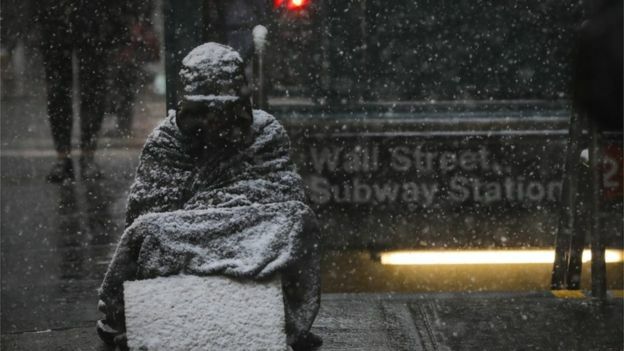 Ninety million people - a third of the US - have seen temperatures of -17C (0F) or below. Some 250 million Americans overall have experienced the "polar vortex" conditions, but southern states such as Florida have escaped the brutal chill. How did the fatalities occur? University of Iowa student Gerald Belz, 18, was found unresponsive behind a campus building before dawn on Wednesday and later died in hospital. Officials said weather was a factor. His father told local news channel KCRG that Gerald was a "mama's boy with a tough exterior". Thursday could see America's third largest city of Chicago breaking its 1985 record low of -32C (-25F), according to meteorologists. 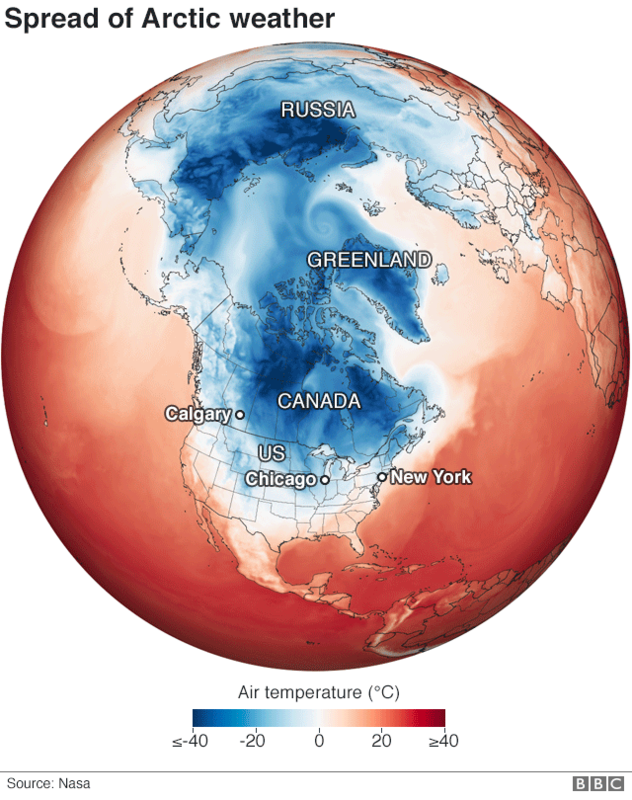 Is the polar vortex linked to climate change? The region near Buffalo, New York, should see the heaviest snowfall. 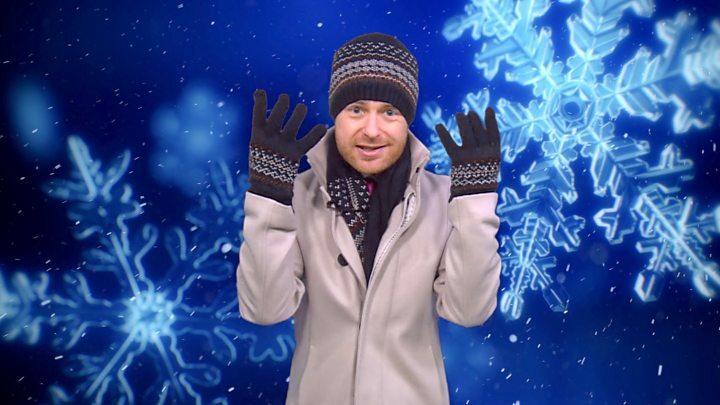 Snow could fall at rates of 3in-5in (7cm-12cm) per hour. The icy cold is expected to loosen its grip on Friday. Media captionSo what actually is a polar vortex...? 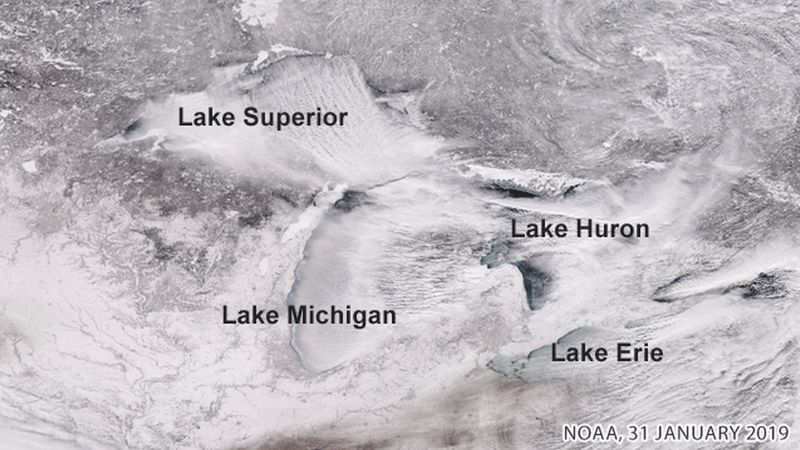 With wind chill factored in, the Midwest and Great Lakes have felt temperatures closer to -40C (-40F) and -53C (-63F), which is enough to cause frostbite in under five minutes. But by the end of the weekend, Chicago could see temperatures as high as 10C (50F). "It's going to be at least a 60-degree swing for Chicago," David Hamrick, a National Weather Service forecaster, told Reuters news agency. The Arctic weather could cost the US billions of dollars. In 2014, a similar polar freeze cost the country an estimated $5bn (£3.8bn), CBS News reported. In Minnesota, residents have been asked by natural gas company Xcel Energy to reduce their home thermostats to 17C (63F) in order to help the company handle heating demands. Michigan residents have had similar requests from their utility companies as providers struggle to keep the states warm. Detroit, Michigan, has had more than two dozen water mains freeze over this week. A city spokesman told the Associated Press the pipes were installed up to 1.8m below the frost line, but with such drastically low temperatures, the ground has still frozen through. The US Postal Service has suspended all mail deliveries for the second day to parts of six states. Over 2,300 flights have been cancelled and another 3,500 delayed due to the polar vortex. As ice and snow continue to build up, roads have become increasingly dangerous across the northern US. At least two people were critically injured in a 27-car pile-up on icy roads in Wyomissing, Pennsylvania. It is reported that the lorry should not have been on the road at the time, due to a weather-related ban. The Illinois city became a frozen ghost town after temperatures fell to -30C (-22F), colder than parts of Antarctica. But as Chicago is forecast to warm up to a balmy -6C (43F) later on Thursday, many residents will have to prepare to return to work. 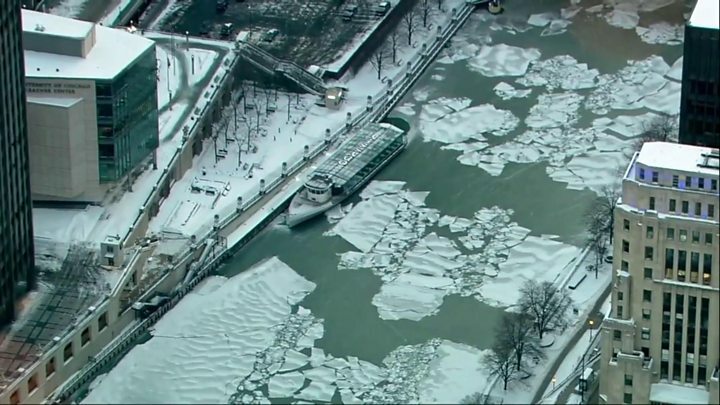 A Good Samaritan paid for 70 homeless Chicagoans to stay in a hotel as temperatures dropped. told the Washington Post: "It's a deadly situation for anyone. We're thrilled that someone was in a position to be able to do this." Most of the thousands of cancelled flights this week were coming out of Chicago's airports - O'Hare International is ranked as one of the top 10 busiest airports in the world. Amtrak also cancelled all trains into Chicago on Wednesday, affecting 55 trains, and said most would be cancelled on Thursday as well. As the Midwestern city is one of the company's hubs, train service nationwide could also be impacted. The chill was even too much for Chicago's Disney on Ice show, which cancelled its Wednesday performance. More than 600 local schools have shut, keeping 360,000 students at home. 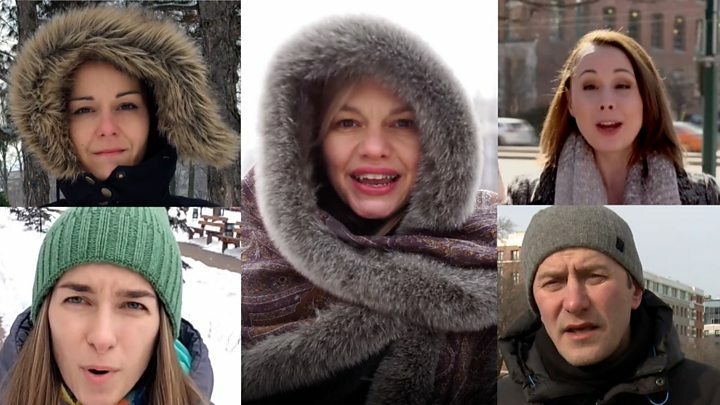 Most of Canada was under some sort of weather warning - from extreme cold in the Prairies, Quebec and Ontario to heavy snows in Alberta and Nova Scotia. In Toronto, where winters tend to be milder compared to cities such as Montreal and Ottawa, temperatures had plummeted to -18C (0F). Icy roads and several transit delays made for a hellish commute for millions of the city's residents. Environment Canada issued extreme cold warnings for most parts of Ontario, Quebec and Manitoba, urging residents to limit their exposure to cold and keep pets indoors. "If it's too cold for you to stay outside, it's too cold for your pet to stay outside," the weather agency warned. Advocates expressed concern for homeless people living in cities hit by the extreme temperatures. In Winnipeg, the capital of Manitoba, temperatures were a frigid -40C (-40F), with wind chill factors making it feel like -50C (-58F). "If you don't get it in December, you will get it in January or February or March. What do you expect? 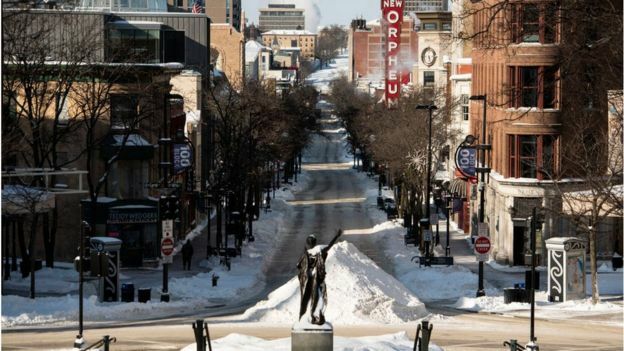 It's 'Winterpeg'," Caroline Rodriguez told the CBC, in reference to the city's nickname. In Calgary, Alberta, temperatures were a relatively balmy -3C (27F), but were expected to plummet overnight and through the weekends. In parts of rural northern Alberta, 15in of snow were expected to fall.